Many people can drive a manual car, but few understand how the clutch works. Most leave the workings of a clutch to their mechanic. It is helpful to know the signs that repair or replacement is needed. A clutch can withstand hard ware, but periodic replacement is needed. 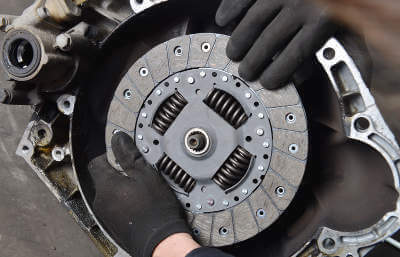 Most problems with a clutch can be avoided by having a vehicle regularly serviced. Knowing how it operates and when service is needed is important. Being able to do so, allows the problem to be addressed quickly. The damage is less severe and repair or replacement not as costly. Two rotating shafts are located in the gearbox. One drives the motor, the other powers another device. The clutch connects the two shafts. That allows them to spin simultaneously. It also decouples the shafts, allowing them each to spin at a different speed. A clutch regulates power to the engine and controls power transfer of the engine to the transmission and wheels. The faster an engine goes, the more adjustment is needed for the clutch to make connection to the wheels. That is how the vehicle switches gears. The basic principle is the same for automatic and manual transmissions. In manual transmissions the friction clutch is between the gearbox and the engine. It allows drivers shift gears and to pull away from a stopped position. Smoke or burning smell- If the vehicle is emitting a burning smell that is similar to an electrical fire or burning rubber, the clutch has been damaged by wear and tear or overheating. Riding the clutch, especially when traffic moves slowly, can be an instrumental cause. Gear slippage- For no reason that is apparent to you, the vehicle slips out of gear. There will be an increase in engine speed as you try to accelerate. This sometimes occurs when a vehicle has a heavy load. One of two things has happened. Either crankshaft oil has leaked or the clutch is worn and in need of replacement. Sticking clutch- If the pedals are harder to disengage or press than usual, a leak is likely the cause. It is not necessarily an indication of clutch failure. The leak does need to be repaired. Failed hydraulic linkage causes a loss of pressure. Being able to identify warning signs lets you know when your vehicle should be headed to the repair shop.